Name a regatta that became the biggest festival in its island state in just three years. Where the King banned all whaling in 1979. 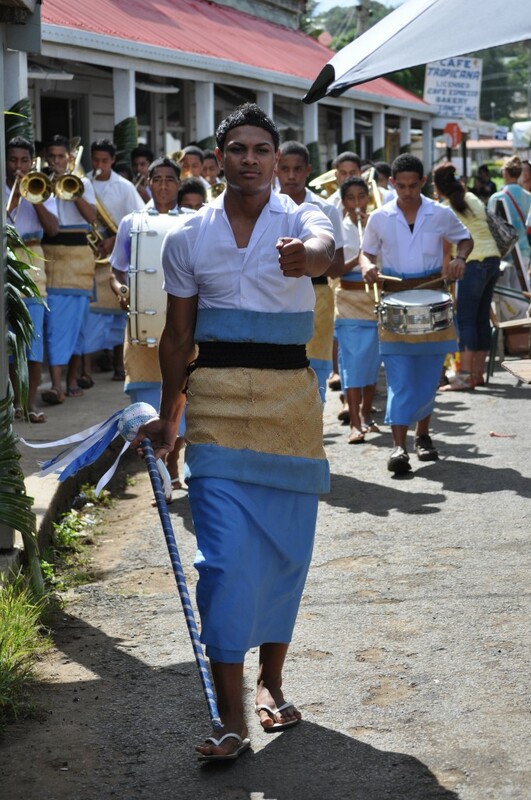 Where a Catholic schoolboy’s uniform mandates the long, wraparound skirt called a tupenu. Where protected sailing waters know nothing of the sea state in (another hint) Oceana beyond. If you said Regatta Vava’u & Festival, you’re spot on, and if you even know about Regatta Vava’u you’re ahead of most. This island chain in the north of Tonga is celebrated among those who know for its diving, whale watching and smooth sailing. The racing fleet—the festival started Wednesday, “racing” kicks off on Friday—has a sprinkling of pretty fast boats. But they’re here because they’re here, just cruising through, most of them on the way to someplace else, or maybe not, most of them being “home” to the crew. Given the remoteness, there is nothing I could write that would destroy the ambiance of a laid-back cruisers’ rally by attracting adrenaline-junky world-beaters. And with only 300 guest rooms on Uta Vava’u, there is nothing I could write that would generate a destructive influx of tourists. As a great American once said, it is what it is. Race one of three simply incorporates the weekly Friday evening race with its unique Chogg rule, Chogg being the whatever-you-think spelling of the nickname of a one-time local who raced every Friday and insisted that he needed help because he always ran last. Thus the Chogg rule by which the last-place boat is allowed to turn for mark number two as the second-to-last boat rounds mark number one. It is assumed that the last-place prize, a six-pack, has no bearing on strategy. Sixty-some boats are entered. I’ll have more precise numbers when “Lisa” finishes her duties as Chief Scorer for today’s Tridecagon-Athlon (egg throwing contests, multi-legged racing, relays, pie eating) and is free to attend to such mundane matters. Then again, “how many” perhaps isn’t really important, in the larger scheme of inter-galactic developments. The smallest boats is “24 feet, I think” and the biggest is “65, or maybe 80.” Which perhaps isn’t really important, in the larger scheme of intergalactic developments. I met “Mark,” who probably has a last name that matters, somewhere else. Out here, he and young Ash and young Cameron are more identified as Relapsed, the name of the Jim Young design that Mark finished building this year after four-and-a-half years on the case. “I said I wasn’t going to have another boat.” And Relapsed probably has a length by which I could identify it, if I had asked before they called up the contestants for a round of (sorta like Rock, Paper, Scissors) Giants, Wizards and Elves. When I see Relapsed, I’ll know more, but Mark assures me there is plenty of room. As they say in Greece, siga siga, which means, siga siga. Hey, here comes the Chanel High School band to crank things up, downtown . 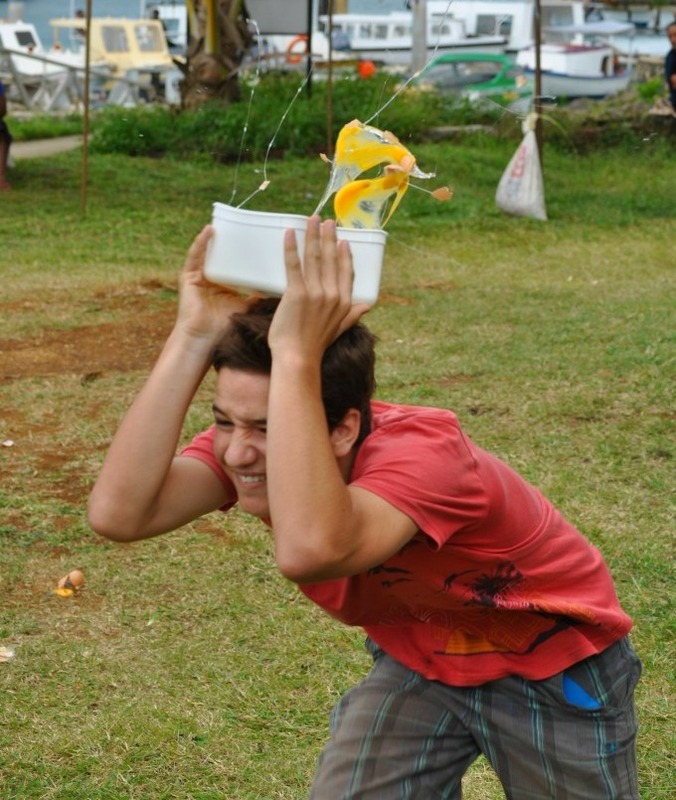 . .
As for sailor games, the last leg of the egg toss awarded extra points for catching the egg in a plastic containeron your head. Looks like this . . .
Uploading pics over the connection at Cafe Tropicana takes about seven minutes per, so I will be atypically frugal, for me, and leave it at that. Meanwhile, I’ll be missing a lot of action on San Francisco Bay, what with the Rolex Big Boat Series and all. I’ll be missing a lot when the AC45s get to racing in Merry Olde England. I must content myself instead with a costumed pub crawl, skies of tropical blue, seas of tropical blue, and temperatures to match. I’m coiled and ready to strike. Bring on the race.